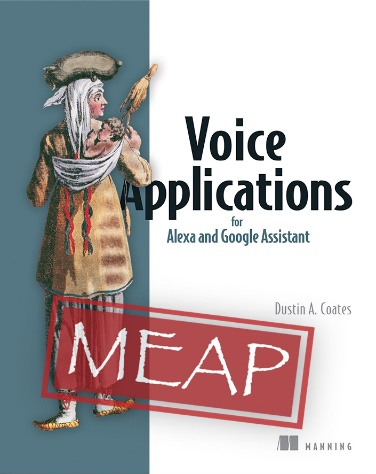 This excerpt from Voice Applications for Alexa and Google Assistant discusses the fundamentals of voice UI design. Save 37% off Voice Applications for Alexa and Google Assistant. Just enter fcccoates into the discount code box at checkout at manning.com. In his talk at Google I/O 2017, James Giangola discussed the cooperative principle. This principle, introduced by Paul Grice, highlights what makes a successful conversation and can be boiled down to four maxims: quality, quantity, relation, and manner. If our skills are liberal in what they accept, this is being conservative in what it says. When these maxims are broken by a conversation partner, the other party may have a difficult time understanding. The maxims can even be flouted to make a point or introduce humor. “I’d like to get a puppy,” the girl says to her father. “I’d like a million dollars,” he responds. This clearly isn’t relevant to the conversation, but the man says this to make a point to his daughter. Be aware. Flouting the maxims is an expert-level move and one that assumes a close bond between those inside the conversation. This is a bond which is unlikely to develop between computer and human outside of science fiction. Ways exist for a voice-interface to evade the maxims without being as clear about it as the sarcastic father. Giangola pointed out as well that we assume that conversations adhere to these maxims. This assumption causes issues when the maxims aren’t adhered to, but provides great benefits when they are. When the outdoors enthusiast asks “is it cold outside?” The response of, “you should consider wearing a jacket today” is assumed to follow the maxims. The user assumes this is an advice based on the question, and not an unwanted comment on how to hide a growing waistline. In this way, the maxims can assist each other. For the weather inquiry, quality and relation reduce the necessary quantity. Imagine that we have created a voice-activated sleep tracker. The sleep quality intent replies back with certain phrases depending on the reported sleep quality. If the quality was identifiably good, the skill responds with “Let’s keep the great sleep going!” A poor night’s sleep gets the response “I hope tonight’s better for you.” Both responses fit the four maxims, and are truthful, the right length, clear, and clearly responding to what was said. There was a third response, too. “I’ve got a good feeling about your sleep tonight.” This ambiguous response follows an ambiguous statement of quality. Imprecision is acceptable in this situation. I call this the fortune cookie approach. When you have expressions to handle that you don’t know upfront, craft a statement that can apply to nearly any that might arise. Because people assume the maxims are always in place, they interpret a vague phrase in a way that conforms to their expectations. The persona of a VUI also influences how the conversation is interpreted by the listener. Although some anecdotal evidence hints that current voice experiences are training people to speak to computers differently than they do to humans, other research suggests that the brain doesn’t make such a distinction. As a result, all of our attendant pre-conceived notions about different kinds of voices come along. All of these ideas help shape people’s ideas of what personality a voice represents. Changing a voice, or even qualities about a voice, can influence how people react to what that voice’s saying. When building for a voice-first platform, you don’t have as much control over the personality as you would if you were building an experience for a phone system, mobile app, or website. Your skill is only a small part of the overall platform and users expect you to adhere to that platform’s personality. You can record your own audio to use in the response or run the responses through another speech to text provider and then stream that back to the user. Hiring and recording voice talent for the skill can create a richer experience, but also comes with the downfall that it’s expensive and out of budget for all but the most deep-pocketed. It also has the downside that it reduces the potential responses significantly; speech can no longer be assembled as-needed but must be re-recorded if a change in the skill calls for it. That’d open the door for using another speech to text provider to use a different voice. A new voice can help set your skill apart from others when done well, but can also be confusing to users if there’s not a good reason for it. Creating and streaming the speech can also introduce extra monetary and latency costs. One aspect of the personality that you have a lot of control over what’s said. A surefire way to have a boring personality is to always say the same response. Repetition is an easy way to take a user out of the moment and have them remember that they’re, indeed, speaking with a computer. It’s also what the sleep tracker skill is doing right now. To make the skill sound more conversational, we should develop multiple ways of responding to the user. In truth, we’re already responding with varied phrases, but each phrase maps to an input. A good night’s sleep is always greeted with “Let’s keep the great sleep going!” Surely there are different ways to answer. Replying the same way each time sounds wooden and stilted. By creating a list of responses and choosing randomly, we can make our VUI sound more fluid and even human. In this code, responses are set as arrays inside an object. It’s unnecessary to have the same number of phrases for each contingency; more common occurrences should naturally have more responses. More options should be available for between six and twelve hours, as these are the lengths most people sleep during the night. A function (pluck) takes a random response on each go. Rotating through responses might seem small, but it can go a long way toward making your skill more enjoyable to use. Beyond adding variety, you’ll want to tailor your responses to the context and the mood. Go ahead, give Alexa some irreverence for the skill of reporting baseball scores. Baseball is a game; no one will get too upset (but maybe do me a favor and be sensitive if the Astros lose in a gut-wrenching fashion). If someone is checking their bank account balance, you may want to lean toward being more sedate. Possibly your user discovered a surprise extra hundred, but it is as likely that the number isn’t as high as hoped and a light mood won’t go over well. This is voice and there are no ways to inject personality with color schemes or typeface choices. What you say’s what users remember. Follow Grice’s maxims. Make your skill’s speech true, brief, relevant, and clear. That’s all for this article. If your interest in voice applications is piqued, have a look at it on liveBook here and see this slide deck.